Address: 120 Yigal Alon st. Although it's not really an American diner, Dixie does have an American feel when you step inside (the booths are doing the trick, we think). But it also has a romantic wine-and-dine vibe (and the dimmed lights are a give away in this case). A good way to describe Dixie and its food is: French kitchen meets Dyer's. Their signature dish is the to-die-for chicken wings! Too buttery for some, but it's heaven on earth for the carnivores and chicken wings lovers. The chicken wings are finger-licking good, so make sure you don't miss out on it. We were very enthusiastic about the scrumptious chopped steak, served with mixed mushrooms and a pepper and cream sauce. This aristocratic hamburger is garnished with crispy fries (yet we asked for the normal fries since the crispy ones are more like potato fritters). 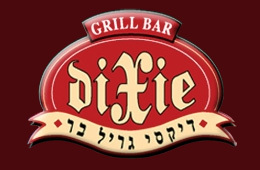 Dixie is located in the area behind Azrieli towers. Take any bus that goes to Azrieli (no. 63 near Dizengoff Center, 27 From Ramat Aviv), then walk straight on Kaplan, towards the Train station. The first big street you'll come across is Yigal Alon. Turn left till you hit Tozeret Ha'Aretz st. There Dixie is located. I love Dixie! Highly recommended!